Having spent my entire life in the Greater Toronto Area, I have been to Niagara Falls more times than I can count. When family and Friends from abroad came to visit they were always eager to see either the iconic Toronto focal point, the CN Tower, or the world’s most powerful waterfall located just about an hour down the Queen Elizabeth Way. In my adult years trips down to Niagara have been fewer and further between. Maybe I took this wonder of the world for granted, or maybe it’s one of those things you can only see so many times. However Niagara Falls is so much more than the falls themselves. The city is home to two world-class casinos, there is a plethora of fantastic restaurants, a brand new outlet mall and even the kitschy tourist trap known as Clifton Hill. My wife and I decided to spend a night at the falls during a recent winter's weekend as a chance to see the falls in their partially frozen state (something, in my years of visiting the falls during the warm summer months, I had yet to experience). 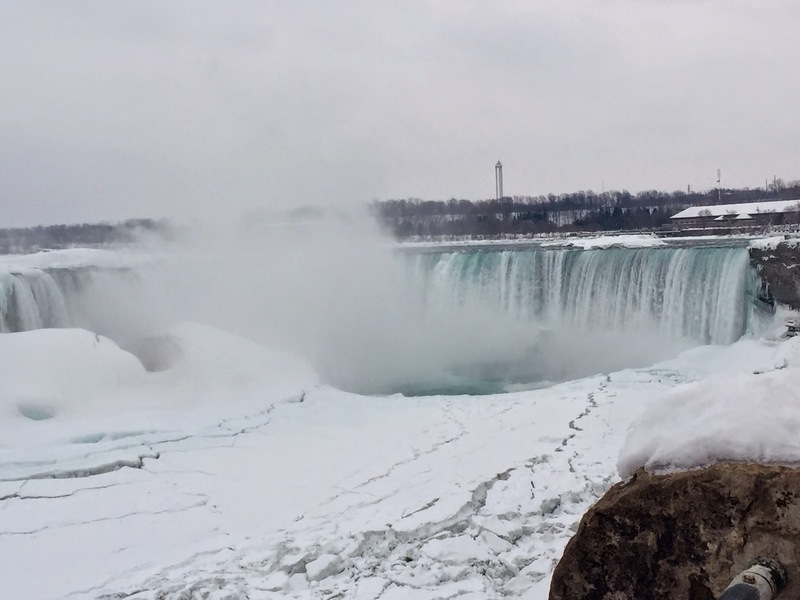 We started things off by taking a nice stroll across Niagara Parkway, admiring the postcard-worthy views of both the Horseshoe and American Falls in their glorious part-frozen, snowy state. 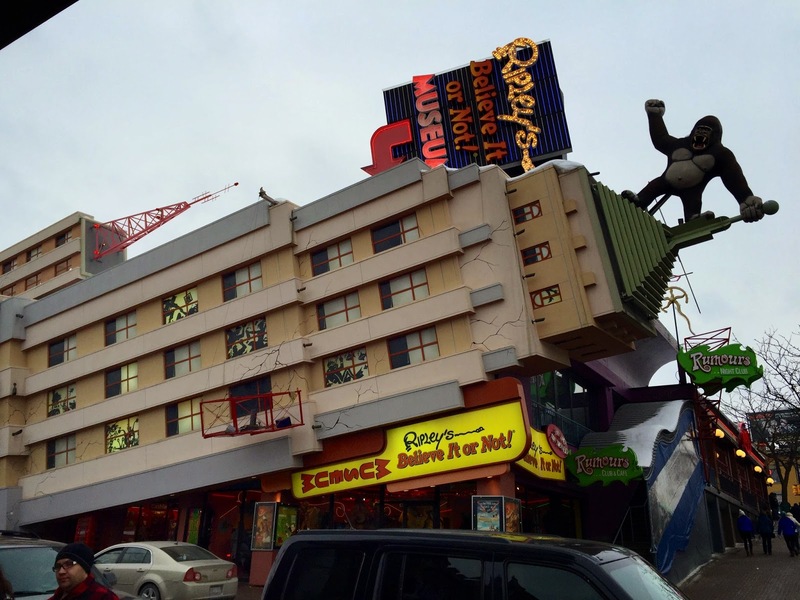 From there we headed up Clifton Hill where you will find a colourful, kitschy display of pop culture. 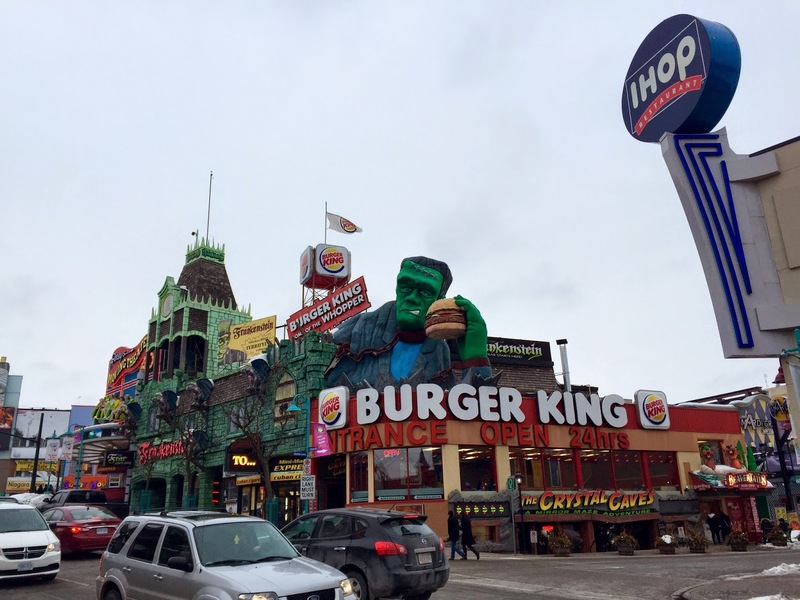 A wax museum, a ferris wheel, an arcade and even a giant Frankenstein on top of a Burger King. We didn’t spend much time on Clifton, as it is easily one of the largest collections over-priced establishments you will find anywhere, but the uphill walk was refreshing and provided a few great photo op’s. At the top of Clifton Hill we settled in for dinner at Antica Pizzeria, a great pizza place we try to make it to anytime we are in Niagara. Then it was off to try our luck at Fallsview Casino. First opened in 2004, Fallsview Casino is about as close as you are going to get to a Las Vegas super-Casino in Canada. It is massive, chic and loaded with Vegas-style extras like boutique shopping, several restaurants including the classic all-you-can-eat buffet, a performing stage and much more. On a Saturday night the casino was expectedly packed and many games were hard to come by. I initially tried to get my hands on some digital roulette (prefer that over the standard table roulette which requires some etiquette), however there were no terminals available, and plenty of people circling waiting to grab anything that did open up. We decided to switch our attention to the slots and digital blackjack where we lost a combined $40, an acceptable “cost of entertainment” for non-gamblers such as ourselves. Fallsview Casino would not be out of place on the Vegas strip. Using our Player’s Advantage Card (the Casino’s loyalty program) we were able to earn free parking at the casino’s underground parking structure. Since our hotel was only about a 7min walk from the casino, this saved us the $20 the hotel wanted to charge us to park for the weekend. Niagara Falls is rightfully one of the top tourist destinations in the world, and it doesn’t have to be expensive either if you do the right research. There are plenty of mid-week hotel deals available through sites like Groupon or WagJag, and sometimes they even include meal, attraction and/or gambling incentives. The falls are beautiful all year round, the dining options plentiful, and you can always find some action at the 24-7 casinos. There is a little something for everyone in Niagara Falls. Here is our review of the Radisson Fallsview Hotel. An affordable and conveniently located home base for your Falls trip. In my next post I'll get to the 2nd portion of our winter getaway weekend. Touring a winery by snow shoe!